As the Internet usage increases, so do the threats that try to get into our PC. Cyberwars and cyberattacks, new tricks, botnet battles and attacks with ransomware like WannaCry have caused chaos during 2017. Ransomware, which are programs that extort you, were one of the most feared threats for many people during this year: ransomware encrypted the data of thousands of PCs and demanded their owners for a ransom in order to recover them. A profitable business for criminals. Therefore, prevention is very important, although antivirus software already defend you against these blackmailing programs and even have certain specific protection modes. Now, if the worst has already happened and the data has been encrypted, there is no antivirus that can help you until a ‘cure’ is found. This is why the best advice is to back up your data and keep it safe. Microsoft is aware that Windows is the first line of defense, so it offers a free antivirus and a basic firewall to stop the most dangerous threats: spyware, phishing, Trojans, etc. With the Windows 10 Creators Update, the brand has improved the security, putting it in the new Windows Defender Security Center where you can manage the antivirus, the firewall, the SmartScreen filter against phishing, and the parental control. Additionally, the latest Windows 10 Fall Creators Update introduces a tool against ransomware so you do not lose all your files if it attacks you: a secure folder that only you can access. This is something that some technology companies already offer, such as Samsung in its latest Galaxy phones. It is a basic protection that works when using the PC casually, but once you start downloading content, visiting forums and social networks, and browsing all kinds of webpages, it is recommended to install a good third-party antivirus. 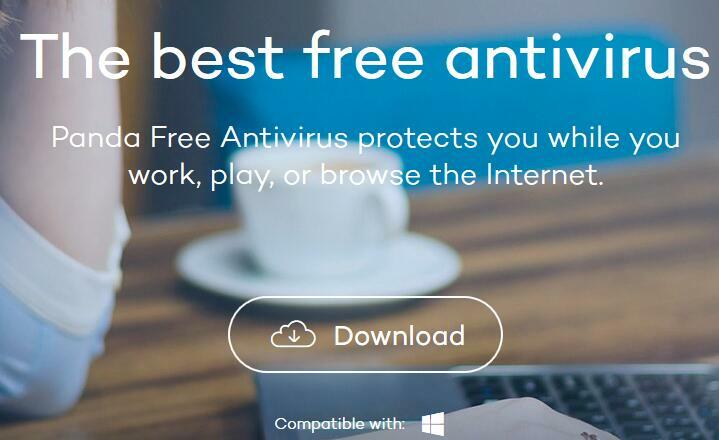 The first choice is evident: free or paid antivirus? A free antivirus, like the ones you will see below, can perfectly work when using the PC on a daily basis, although if you are looking for additional security measures, such as real-time protection, virtual private networks, etc., you may need a paid antivirus. In the link below, we explain the advantages of free and paid antivirus. 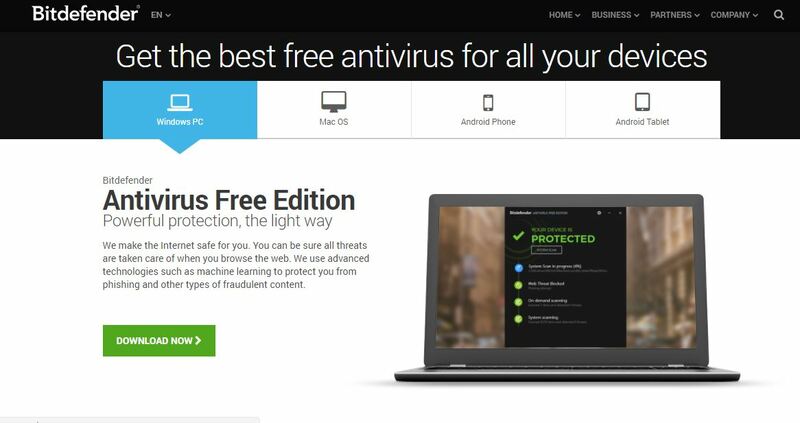 Free antivirus are undoubtedly the most popular. In this article, we have listed the best free antivirus of 2017 for your Windows PC. Click on Next to see them. Instead of limiting myself to making a list of every free antivirus for Windows currently available, it would be better to review the features present on a good antivirus along with some precautions and additional tools that we have to bear in mind. 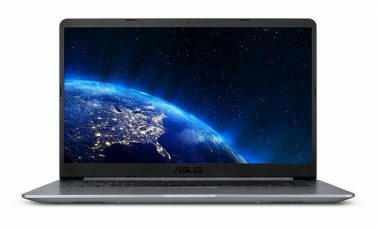 Do we need our antivirus to be constantly scanning our PC’s files and programs or is it enough with running a full scan once a week? The best option is to go for an antivirus with real-time protection, but this means that the PC will lose resources to run this program. If you do not need a permanent protection because you constantly access the internet or external sources (external drives, etc. ), maybe having an on-demand antivirus would be enough. The same goes for old devices or devices dedicated to tasks requiring all the memory and available resources. On a personal note and for a typical work environment with permanent access to the internet, I recommend using an antivirus with real-time protection while having a secondary on-demand antivirus as an option for a better protection. For an antivirus to be free does not mean that it is not profitable. It may happen that the antivirus shows ads on its interface, which is not bad per se, but it can be bothersome and cause some rejection. The same happens if additional programs are recommended when installing the antivirus since it is a form of advertisement. This is usually not a problem, we just need to pay attention to the setup wizard and uncheck the option for any toolbars, programs, etc. The program’s license is an important detail. Free antivirus for Windows are typically designed for being used at home, not in workplaces. We need to pay close attention to the license before installing any free antivirus, especially if we manage networks or all the PCs in an office. The difference between a free antivirus and a paid one is mainly found on the technical and payment support, and on a more advanced interface with more features than the free version. Even so, there are also differences among free antivirus. On an internal level, they may use their own engine or an external one. Eset, Avast, AVG, Bitdefender or Kaspersky, just to name a few, use their own antivirus engines. Other brands use third-party antivirus engines such as Bitdefender’s engine, which is used by Lavasoft Ad-Aware, BullGuard and Auslogics, among others. There is also a third option, which is to combine a proprietary engine with a third-party engine, like Emsisoft, Ashampoo and F-Secure do. As for additional features, we can see if they have specific monitoring for email and web browsers (which are the main ways virus get in your PC), proprietary or third-party firewall, and if they update definitions automatically (and how regularly), etc. An antivirus is one of the pillars of your PC’s security, but not the only one since having a firewall is as, or even more, important as having an antivirus. Despite Windows having a built-in firewall, we may want to use a third-party firewall, a more customizable one, or one providing more real-time information about data input and output. GlassWire and the popular ZoneAlarm are two examples, but there are a lot more firewalls out there. I would include a tool for restore points as a third option since sometimes the only option is to restore our files if both the antivirus and the firewall fail to protect us against malware, such as the popular ransomware. Therefore, having restore points can be our salvation. Being safe or unsafe also depends on ourselves. It does not matter whether you have a good free or paid antivirus if you are still going to download files from any source or access webpages that are not recommended. Taking some precautions, such as the ones recommended by experts, will help us web browse or work with our PC seamlessly even if our antivirus cannot keep up with us. There’s no one that hates a virus more than I do, I can assure that. The malware is not only capable of destroying your PC and files, but it can also steal your private information. Malware should not be taken lightly, and for that reason, you should always be aware of where you connect your devices. Connecting your devices in an unknown place makes it very likely for you to get a virus in your storage device. Not connecting your devices in an unknown place is the second form of prevention. The first form is personal: to have an antivirus installed in your PC. Especially if your computer uses a Windows operating system. Although it is a hard thing to accept, the Windows’ Firewall is not the only program that you should use to protect your PC. Although Window’s Firewall is constantly improving, it is always good to have extra protection. For that reason, the best recommendation is to protect your equipment with a good antivirus. If you want to keep your software safe and cannot afford it, do not worry. There are many good options of free antivirus software on the web, and we will be naming them and explaining the best options throughout this article. If you have any questions, feel free to write to us below and we will gladly help you with any question that you have. Bitdefender Antivirus Free edition is one of the best free antivirus programs that currently exist on the web. It is a Romanian software security company and it is the first on our list. This is due to the fact that Bitdefender Free edition is easy to configure and it doesn’t use much of your system’s resources. Its Antivirus motor is exactly the same as the one tested by independent laboratories. Moreover, its doesn’t ask you to update to the premium version every other moment, as generally seen when using many other programs. As you might expect, this program doesn’t have as many features that are offered in the paid version. However it does have the exact same basic protection against malware, malicious web pages and fraudulent sites. If this is all you are looking for, then there is no need to spend money on protecting your system with Bitdefender. Bitdefender is completely compatible with Windows 7, Windows 8.1, Windows 10, MacOS and Android. Avast Free Antivirus is a popular name amongst the best free anti-viruses, that’s why it is second on our list and we are sure that you must have heard of it. It has an antivirus and anti-spyware engine that protects your PC from threats found online, in files, emails and in instant messages. Apart from regularly scanning for malicious software, Avast’s software also analyses all of the installed programs and makes sure everything is OK.
One of the main reasons we recommend Avast Free Antivirus is due to its “heuristic motor”. Enabling it to detect viruses and other malicious software that were previously unknown. Even though the scan takes a long time, it is completely worth it. Its installation is extremely simple, but it is necessary to be careful with extensions such as Chrome and google Toolbar. The main window is a dark grey with the menu on the left hand side. As well the main status page, you can use the menu to select protection, privacy or performance. 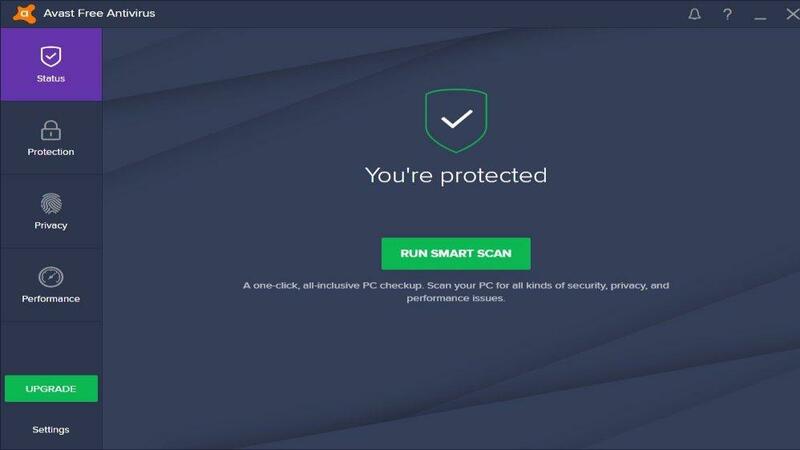 These pages include icons that display all the features that are offered by Avast’s line of products, with a lock symbol next to those features that are not available with the free version. Furthermore, you can use the program for free as much as you want and it is available to be used on as many devices as you need. Avast is available for Windows 7, Windows 8.1, Windows 10, MacOS and Android. AVG is a reliable option for virus detection and protection. It is often considered as one of the few providers that send quality and protection features with the free package. In addition, AVG has improved its malware protection rate which now rivals industry leaders such as Bitdefender. This protection activity online, watching out for strange activities that can occur in your email or websites that you visit. This antivirus software only moderately slows down your PC while in use and offers a wide range of options for personalization. Other features offered by this software for Windows and Mac include spyware, web portal for web protection, among others. The main window has two main panels: the basic protection panel includes icons for equipment protection and for email and web protection, both will be enabled. Nevertheless, during the installation process, you should pay attention to the checkboxes. As in all the programs that you install, so that you have no “extra programs” in your PC without your approval. In the middle, under the two aforementioned panels, there is a button called Scan Computer. Upon clicking on it, it initiates a complete exploration, that is more than scanning to detect malware. 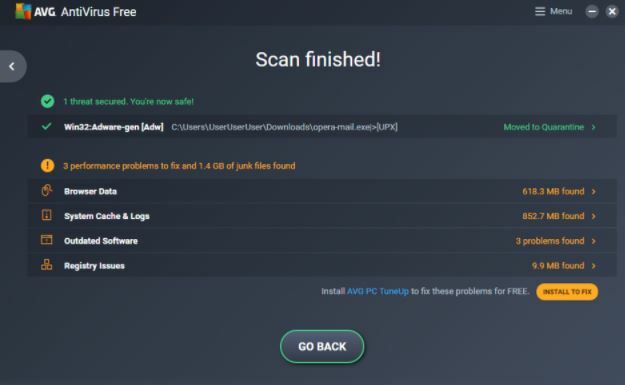 AVG, one of the best free antivirus programs, does not interfere much with your operating system and has a minimum impact on the boot process. It is available for Windows 7, Windows 8.1, Windows 10, macOS and Android. Avira offers strong protection against general malware. Furthermore, this software continues achieving high results on the AV-TEST, eliminating 99.7% of threats that were tested. 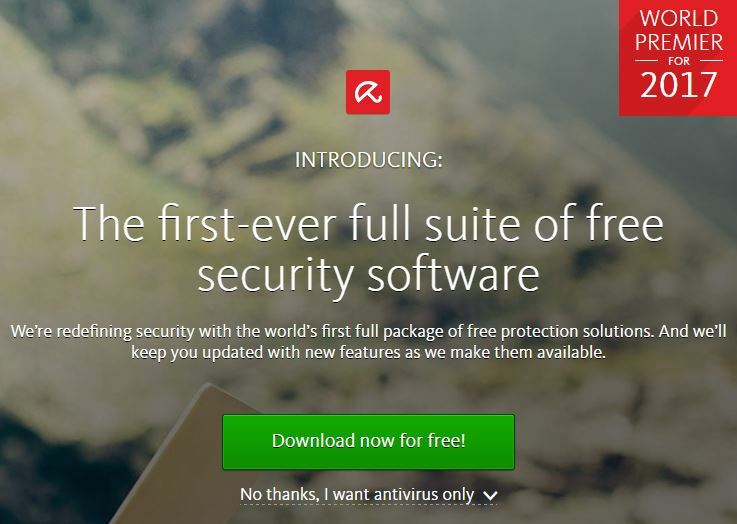 Avira Free Antivirus offers a high degree of customization and a wide range of free complementary functions that include: a VPN client and a browser which focuses on privacy. This is one of the best Antivirus packages of 2017. The main window of the Antivirus is white, with a simple menu. It has a dashboard on the left with a few panels that display certain status information and offers access to its functions. From the PC protection option, you can start a scan, activate real-time protection or explore the advanced settings. It has a sleek user friendly interface,it also discards false positives, keeping them to a minimum. The range of Malware that it protects you from makes it one of the best free antiviruses available, additionally its heuristic engine and the fact that it is easy to use makes it all the more favourable. There are a certain amount of Pop-ups and ads that may be a little annoying but they are not too bothersome. Sophos does a little bit more than most of other free antivirus. It is a software that provides business-grade security for your home. The only thing is that you must visit Sophos Free Antivirus’ website and create an account so you can get the free version, but in turn you will get standard antivirus and anti-malware protection along with browser tools, such as anti-phishing and, most importantly, content control. If you install Sophos in Mac or Windows, you will see a very simple main interface with a big banner at the top showing your security status along with a notification button and a button for online support. You can click to start a full scan. You have the option to activate the automatic protection against virus, the web protection and the detection of potentially unwanted applications. Besides scanning your system for deadly viruses, Sophos also monitors your web activity closely. Its web protection feature blocks unsafe websites and its app detection feature manages unwanted apps. Although AV-TEST has not officially reviewed Sophos’ capabilities, another testing lab, AV-Comparatives, gives Sophos a decent rating for its antivirus capabilities. Sophos is available for Windows 7, Windows 8.1, Windows 10, and macOS. If you are looking for a good antivirus protection without sacrificing your PC’s resources, Panda Free Antivirus may be what you were looking for. Panda impacts the system’s resources as lightly as possible, at least when it runs silently in the background. It is a free antivirus that has been improved, as it automatically saves threat detection techniques from other users who have installed the program, thus helping you to protect yourself against new and future attacks. The testing lab AV-TEST will probably find that Panda has a bigger impact on a lot of the system’s most common tasks, such as installing programs, copying files and downloading apps, than most of any other software, but this is not something that you should be worried about. The downside is that it may often show you the option to upgrade it to the paid version and you may get some false positives when scanning. However, Panda has a lot of options for customizing and scanning that overshadow those details. Its real-time protection is capable of detecting even the latest malware. This antivirus also provides constant antivirus protection, which means that Panda Protection can entirely replace other antiviruses from companies like McAfee and Norton. Panda is available for Windows 7, Windows 8.1, Windows 10, and macOS. ZoneAlarm is a well-known company that achieved success a few years ago with its popular free firewall. As firewalls started to be featured in routers and in Windows itself, ZoneAlarm had to evolve so as not to lose its presence on the market. It now offers a full solution comprising a free antivirus and a firewall called ZoneAlarm Free Antivirus + Firewall. It includes real-time protection, virus scanning, firewall, an application control that detects any malicious software, and identity protection to prevent phishing and ransomware. Using it is really comfortable thanks to the tabs that allow us to run manual analysis and access any of its tools with their own settings. Besides, the protection can be enabled or disabled with a single button. It gives you 5 GB of cloud space and the option to create online backups. It also has a Game Mode that frees up resources and prevents notifications from popping up. The antivirus’ engine is licensed from Kaspersky, which ensures your protection. But of course, keep in mind that it displays a lot of notifications, especially because the firewall blocks anything suspicious. 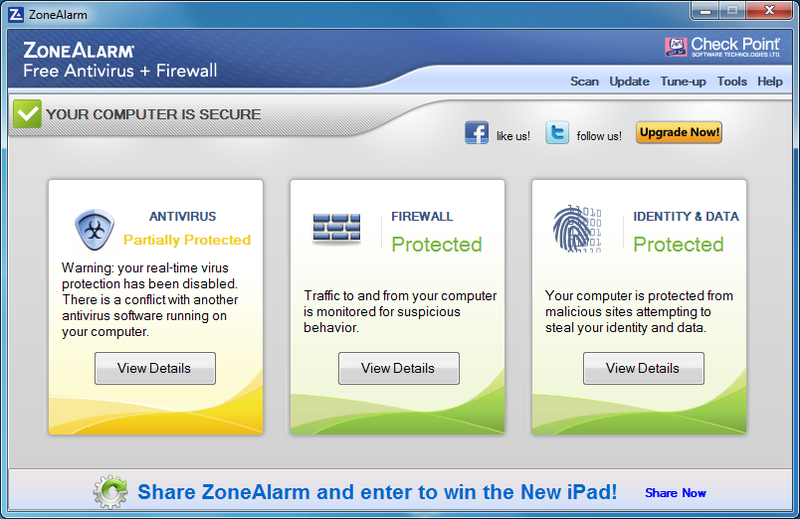 Download ZoneAlarm Free Antivirus + Firewall from its official webpage. 360 Total Security is another of the most outstanding antivirus of the year. It works correctly from Windows 7 to the latest Windows 10 and its interface is very simple and easy to use. This antivirus uses five engines, including 360 Cloud Engine (run by Qihoo, the company developing Total Security), QVMII, Avira and Bitdefender. However, it is not recommended to use all the engines at once because the RAM and battery consumption are excessive, whereas using only two or three provides a normal performance. This antivirus also has a ransomware decryption tool, a registry cleaner, a firewall, protection of files and sandboxing, and offers the possibility of installing the 360 Total Security extension on your web browsers. With it, the antivirus will notify you if you get into suspicious webpages, if you have pending updates, etc. 360 Total Security displays the protection status, the startup time and disk usage, and it also offers quick access to key full check and cleanup features. With this antivirus, you will be able to speed up your PC by disabling the startup programs’ processes that slow it down. Comodo Free Antivirus is a product with a lot of features whose basic version is totally free. This brand offers free security products, but it does not make any profit unless someone pays for them, so Comodo is unusually persistent at trying to make you buy it. Congratulations if you manage to install it without a lot of Yahoo’s ads making their way into your PC. Pay attention: if you click on one of the installation screens without reading it first, you will see Yahoo set as your home page, new tab and default search engine in all of your browsers. The reason is simple, as this software receives money from Yahoo by doing this. Comodo makes sure that all the running programs are scanned by it. This free antivirus also comes with a cloud-based scanning option that is always updated with the latest threats. It keeps improving itself as new users continue to upload their data, which is a feature that benefits the best antivirus software. Besides its performance, this is one of the best free antivirus in terms of design. Every basic and important option are shown with big buttons on the home screen. You can also opt for the advanced layout that has Auto-Sandbox, Viruscope and the host intrusion prevention system. Comodo is available for Windows 7, Windows 8.1, Windows 10, macOS, Android and Linux. Adaware Antivirus 12 received a makeover and now has a new name and a new look. However, its test results are not the best, and competing free products have much more to offer. But this antivirus is nonetheless among our top recommendations, so you should not worry too much. 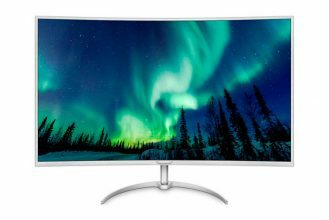 Pay attention, Adaware provides free protection the moment your PC starts, which means that it is always running in the background scanning files. This also means that this software can entirely replace any premium or professional antivirus software that you may be paying for, such as McAfee and Norton’s products, so bear this in mind. Before installing Adaware, you have to uninstall any previous antivirus. This new Adaware 12 unlocks the version 11’s Web Companion that blocks malicious and fake URL, and it only affects dubious downloads. The main advantage is its mostly white design with green shades and orange buttons. The menu on the left has icons for you to get access to several of the program’s features. However, most of the features appear as updates, meaning that you do not have access to them unless you pay for them, obviously. In other words, every feature on the home screen require an update except for the malware scanning and the real-time protection. By clicking the icons on the left side, you will see features requiring an update in almost all of the items. 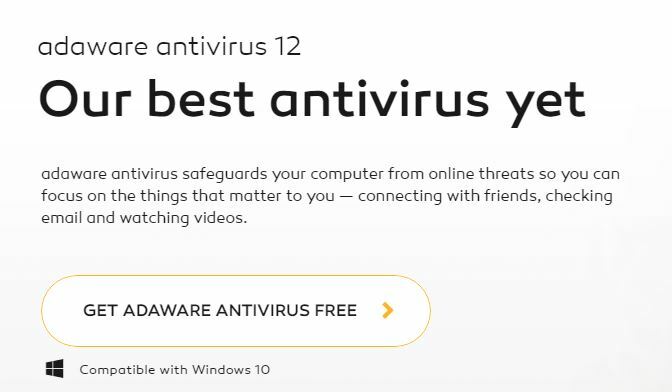 Adaware Free Antivirus is compatible with Windows 10, 8, 7, Vista and XP. Macintosh Security Essentials is definitely one of the best antivirus software available at this time. Even though Microsoft is relatively new to the world of antivirus software, this is a good alternative. This tool is compatible with Windows 7 and Windows Vista, but the anti-malware protection in MSE is part of the integrated Windows Defender in Windows 8 and 10. Clearly, Windows Defender cannot compete against paid products. But, as we know that Microsoft is focusing more and more on the security field within Windows 10, we can expect things to improve. 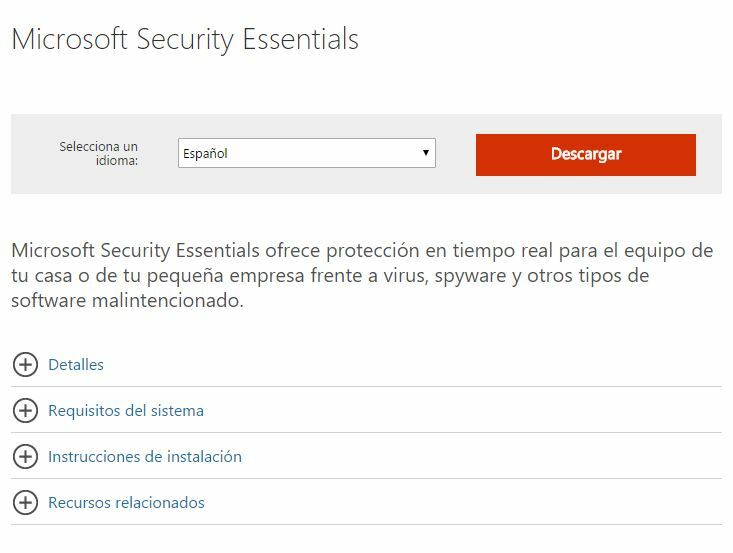 The major reasons that Microsoft Security Essentials is on the list of the best free antivirus products is because it is available directly from Microsoft and also because it is very easy to use. You can easily see if your equipment is secure against threats: if the icon next to the watch is Green, you are good; if it is red, something is not right. It is compatible with Windows Vista, 7, 8 and 10. As an add-on to this list, we bring you another software that is specialized in malware. It is not treated as an anti-software package, a difference from the others in the list. Even so, most users adore this tool and use it as an add-on to the others, to scan in your PC in search of any malicious thing. Besides this is a free tool. For this reason we decided to mention it as an Extra on this list. Malwarebytes Anti-Malware focuses on capturing the latest and greatest known threats and other antivirus companies have not yet captured, instead of choosing to approach the more general malware threats on the Internet. This has a free version and a premium version. Like almost all software. Unlike the premium version, Malwarebytes anti-malware software does not permit users to program scans, so you’ll have to manually open the program and click on the Scan button each time you want to search for malware. After an exploration, Malwarebytes Anti-Malware will show you the suspicious elements it has detected and will ask if you want to put them in quarantine, ignore them this time or exclude them from future Explorations. You can also eliminate them once they are in quarantine. We recommend Malwarebytes Anti-Malware, as good free extra software. But only at a complement to the true protection that your personal antivirus can offer. Which antivirus is the best one? The reason behind these recommendations are for you to have the best free antivirus in your PC. Each antivirus on this list would be a good option to choose, but we know that every user has different tastes and needs. This is why we will recommend you some of the best ones based on their specific features, which may help you choosing one of these of you own accord. Among all of the antiviruses on the list, we chose Avast Free Antivirus and AVG AntiVirus since they top every other antivirus on a general ranking. Both of them get great scores from independent testing labs and are two of the most used and well positioned antiviruses, according to the internet. Both of them also offer some extra features that make them special. For example, Avast offers a passwords manager and a network security scan as part of its tools. Avast Free Antivirus has existed for a long time and it is an excellent free antivirus software in general terms, as it includes almost everything that you might want on a free or paid antivirus. In Avast Free Antivirus you will find a full anti-malware tool for protecting your PC efficiently without wasting any money. As to AVG, it is one of the best antivirus currently available mainly due to its large number of premium-level features, full antivirus and anti-spyware engines and its automatic full updates. As it is a good antivirus and one of the best that we have chosen, AVG provides constant free protection, also known as Resident Shield, against malicious elements. To understand this better, it means that AVG can entirely replace antiviruses from other companies, such as McAfee and Norton, that charge you for their software and the annual access to updates. 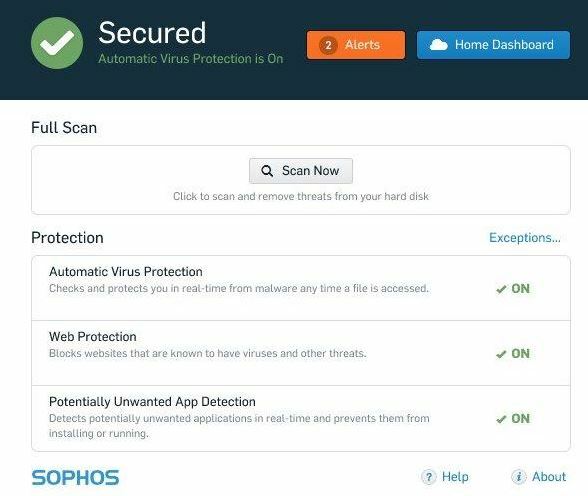 If you are thinking about an easy-to-use antivirus and an option specifically for families, we recommend you to go for Sophos since it is capable of managing up to 10 PCs from a web browser and of blocking unwanted webpages. It also includes classic features, such as antivirus and anti-malware protection, and scanning. Sophos’ Home version is simple and neat with basic notifications, web browser controls and scanning tools that everybody can use. It is the ideal option for those wanting to focus on parental controls besides the other features offered by the program. The software currently works with Edge, IE, Safari, Chrome and Firefox. If you are worried about the space that the antivirus might take in your PC, we will show you some of the lightest and most easy-to-use options on the list. The first one is Avast! Free Antivirus. Although we have already mentioned this antivirus at the beginning, it also fits the category for the lightest antiviruses. With just 10.1 MB for Mac devices and 4.83 MB for Windows, it is the most sough-after software and the first recommended option for any professional quickly looking for a free software. The ICSA-certified Firewall is one of Avast’s highlights. If you are a Linux user, an initial registration gives you a 30-day free trial for a non-commercial usage. Additionally, it has an ideal working set of 9,706 KB and resets every 10 seconds for a scan working set. Another antivirus that you could choose is BitDefender since it has a minimalist design that makes it low-maintenance. Although the program does not have any kind of settings, it automatically scans your PC in the background with its cloud-based detection. If it finds any malicious software or alert, it runs a fuller scan. Besides being a highly recommended antivirus that blocks and removes any malware, this lightweight program has excellent anti-rootkit and anti-phishing tools, with the latter detecting and blocking fraudulent sites through an HTTP-based scanning. As a last option for lightweight antivirus, you can go for Panda. This antivirus is responsible for detecting over 250 million threats. By weighing only 2.15 MB, we highly recommend it in this category. This lightweight antivirus is based on cloud computing, which does not stop it from being powerful enough to protect your PC. Panda also has parental control and an integrated location service, and takes care of your PC without overusing the memory. Additionally, it has an ideal working set of 31,714 KB and a scan working set of 76,498 KB. In this category we can inform you that not every antivirus has a firewall since it is an additional feature. You probably already know about firewalls if you are a Windows user, as it has its own built-in firewall, although it is not exactly a very good one. In this case, if you want an antivirus providing another protective layer, we recommend you ZoneAlarm. For a free software, it is a full-fledged one. Besides having all the expected standard antivirus features, we can tell you that it includes a basic firewall. It also provides a basic identity protection that will allow you to know if there is any unauthorized change in your files related to credit activity. Another antivirus rocking an integrated firewall is Comodo. This software is available for Windows and Mac, and it has a firewall along with its antivirus capabilities. Its features are designed for small businesses, but it is available for any user by downloading the free version that we discussed earlier in the article. Its interface is neat and it has a wide range of settings along with a large set of tools that will be very useful for you as an average user. Comodo has also done an outstanding job in keeping itself updated with the latest security options, including cloud-based whitelists for service providers, auto sandboxing for any unknown programs to be run in a safe environment before being integrated into the rest of your OS, etc. As a bonus, we can tell you that Comodo has new additions as an antivirus, such as a game mode designed for home PCs, which makes this software even more versatile. Do you know any other free antivirus for us to recommend? What are you waiting for? Leave your choice in the comments section for us to analyze it and share it in our antivirus compilation. Avast Free is malware in the worst way. I installed it about 6 weeks ago. Within few days I thought I’d try Clean-up. Hey, it said I had 30 day free trial. Not impressed, I uninstalled the Clean-up. About a month later I was billed via PayPal, even though I uninstalled it with a few days. I’m still trying to get some response from Avast, let alone a refund.